Lately I keep hearing or seeing all over the place the idea that we are all pleasure-seeking organisms. From when I first heard this a few years ago it has never resonated with me. Maybe because it has taken me a long time to cultivate a practice of enjoyment (like rolling down hills) or because it’s never been how I’ve thought of myself. I’ve always believed that I’m the “strong one”, the “brave one”, the “responsible one”, even the “heartbroken one” or “persecuted one”. Those archetypes don’t really leave much room for belief that there is anything at all enjoyable in life. It’s supposed to be all hard and painful – isn’t it? Or at least I should constantly be getting ready to expect that it will be…shouldn’t I? So where is there pleasure in that ever-vigilant existence? 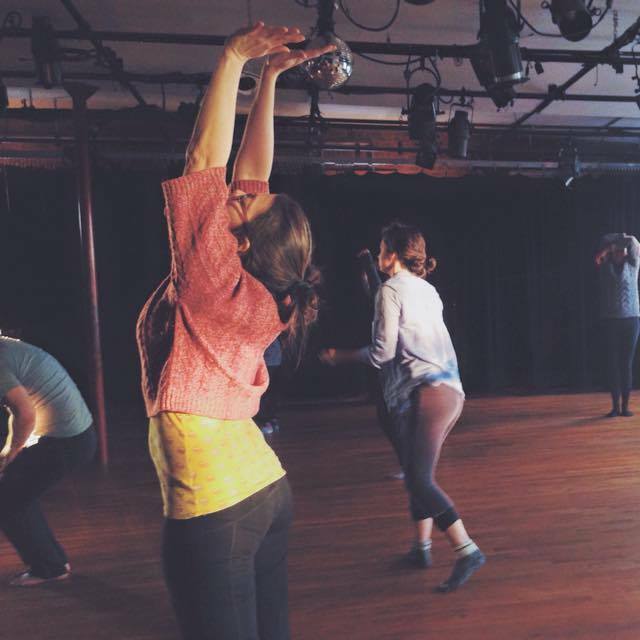 The other weekend I went to a movement and dance workshop with Donofrio Dance Company in Brooklyn. We were guided through a masterful series of exercises culminating in one where we each took turns dancing or making movement and everyone had to copy the leader as a group. What happened was interesting. I had been so much out of my head and in my body for most of the workshop that my thoughts weren’t running the show. My mind was quiet. My body in flow. Everything felt good. I felt good. Then a leader started moving in a way that was uncomfortable to me and to my body. “I don’t want to do this any more”. Bam! Instant deep thought. We moved on to enjoyable movements (for me). No thoughts came up. Enjoyable movement returned – no thoughts – joy even spreading back through me. I smiled. I felt blissful in every cell. Discomfort returned in another movement and my thoughts grew more and more wild, the energy behind them became more forceful “why am I even here? I want to leave. I want to leave. I want to leave. When is this going to be over? I don’t want to do this any more”, and I started scheming ways to get out of the room. Watching the door and planning my escape over and over – the details becoming more and more elaborate. I did stop at one point to get some water, taking a break from the uncomfortable movement and a moment to check in with all of the thoughts that were rising to the surface. When it was over I shared my experience with the group and what had just happened stayed with me. I can see how that happens in life – and the larger a current or anticipated discomfort feels the deeper and more intense my thoughts might be. Convincing me in a myriad of ways to not go there. Danger. Danger. Sometimes that is justifiable and useful – when there actually is something dangerous happening in the present moment. Most of the time (gratefully) in my life there isn’t true immediate danger so perhaps it’s also necessary for me to know that discomfort is only temporary. I can see now how over my life I have built up elaborate ways of believing that all that what lays ahead will likely be painful and intolerable which has led to fear. I always thought it was fear of being in pain but actually now I think it was also a fear that there would never be a return to pleasure. That if I move away from pleasure, I won’t be able to get it back. And just in case that uncomfortable (current or perceived) experience becomes so big it feels insurmountable then I will have to believe that I am strong enough to get through it. I no longer need to assume that I AM all of those archetypes when I can now see that they were constructed. It must have started with one experience of discomfort that had thoughts rise up around it except somehow I got stuck there. I must not have liked what was happening but a part of me believed the thoughts were true and in their strength, they stayed with me. Over time, my thoughts surrounding discomfort and pleasure grew with each experience that fit the bill, reinforcing my beliefs, and ultimately helped me create what I believed I needed to be in order to cope with what I believed life to be. This happened until it was all so thick and focused on constantly seeking or preparing for or staying in discomfort (because current discomfort must feel better than that future unknown discomfort, right? ), it didn’t feel like there was any pleasure in life. Except in this workshop I didn’t even notice I was in a state of pleasure until it was gone. There are now spaces in between what has previously felt like constant discomfort where I feel and enjoy pleasure. There always were – I just couldn’t always see them because they didn’t fit in with what I believed and my thoughts were constantly running. So then maybe I can also be the “fun one”, the “spontaneous one”, the “happy one”, the “love-able one”, the “pleasure-seeking one”. Maybe I always have been, I just didn’t believe it. Underneath that avoidance at its core is the desire to seek to be in pleasure constantly. It feels counter-intuitive in a way because the thoughts can be so powerful (at least in my experience) and maybe those deepest, devastating thoughts aren’t actually calls towards getting out of the room but a way of saying bring on the constant pleasure and allow the enjoyment of life. As I saw in the workshop if I was in a moment of discomfort – actually in it in real time – it passed. Pleasure came again. This experience reminded me that on retreat last year I noticed that every time I went into a balancing pose my thoughts went from zero to a million instantly. Escalating in energy so much that I’d fall over. Balancing at that time was not pleasurable and my thoughts took over to get me out of it. Does that mean I should start believing that I can never do a balancing pose again? Does it mean I stop practicing those poses? No. Though I do know they don’t happen much in my own practice – so I go to classes to make sure I practice being in them (and sometimes, recently, they feel very pleasurable). If I can tolerate those temporary moments of discomfort – know that just as I move from one pose to another this state too will pass. Then, perhaps I no longer need to believe that the elaborate schemes are true but know that discomfort happens sometimes. That when it occurs there’s nothing to be afraid of. I can be with it and can tolerate the sensations and thoughts, but do not need to get stuck in that state of perpetual discomfort. I no longer need to allow those thoughts in the moment to expand so much that they become beliefs not just of how I experience life but of who I believe I am. To know that they’re just thoughts because of the discomfort I’m experiencing in that moment (or as a way of trying to keep me out of something in the future that I perceive as discomfort) and that it will pass. To trust that instead of having to believe I am a certain way that I have the ability to navigate those difficult moments as they arise. To know that pleasure will return again, and I can allow it to flow, but to not get stuck in it either. In the experience at the workshop I could move back and forth between the two states and, in time, perhaps I can be with the states of discomfort and pleasure both equally, trusting in both states that I know how to be, and bringing into balance all of who I am.